Multi-platinum selling artists Fall Out Boy and Wiz Khalifa announced today their 40+ city Boys of Zummer co-headlining tour in support of their respective hit albums American Beauty/American Psycho and Blacc Hollywood. The summer tour will kick off on Wednesday, June 10 at the Susquehanna Bank Center in Camden, NJ, and continue through cities including Chicago, Toronto, Nashville, St. Louis, Atlanta, Dallas and Las Vegas before concluding at Los Angeles’ famed Hollywood Bowl on Monday, Aug. 10. American rapper, singer and hip hop artist Hoodie Allen will serve as special guest on the tour. Citi® cardmembers will have access to pre-sale tickets beginning Wednesday, January 21 at 10 a.m. local time through Citi's Private Pass® Program. For complete pre-sale details, visit www.citiprivatepass.com. General tickets for select cities will be available at www.livenation.com beginning Friday, January 23 at 10 a.m. local. American Beauty/American Psycho is Fall Out Boy’s sixth studio album, set for release on January 20 on Island Records & DCD2 Records. The record’s first single “Centuries” was certified platinum and served as the theme for the first ever College Football Championship on Jan. 12. The song is now Top 15 on the Pop charts after going Top 10 at Modern Rock and has been streamed more than 60 million times between YouTube and Spotify alone. The band most recently performed the track at the 41st Annual People’s Choice Awards. Prior to American Beauty/American Psycho’s release, tracks “Irresistible” and “Uma Thurman” went straight to #1 on iTunes – “The Kids Aren’t Alright,” and “American Beauty/American Psycho” also both hit the iTunes Top 10 when made available with the album’s pre-order. The album is the follow-up record to the band’s gold-certified fifth studio album Save Rock and Roll, which debuted at #1 on the Billboard Top 200 and #1 on iTunes in 27 countries upon its April 2012 release. American Beauty/American Psycho is available for pre-order now on the band’s Webstore and iTunes. Hailing from Chicago, Grammy-nominated Fall Out Boy — Patrick Stump (vocals/guitar), Pete Wentz (bass), Joe Trohman (guitar) and Andy Hurley (drums)—has appeared on the cover of Rolling Stone and other prestigious publications. They have performed on Saturday Night Live, The Today Show, America’s Got Talent, The Voice, Late Night with Jimmy Fallon, The Tonight Show with Jay Leno, Conan, The Late Show with David Letterman, Jimmy Kimmel Live and many more. More information can be found at www.falloutboy.com. Multi-platinum selling recording artist Wiz Khalifa burst on the scene with mainstream success with the release of his first major label debut, Rolling Papers, in March 2011, which spawned the hugely successful hits “Black and Yellow,” “Roll Up” and “No Sleep.” He has earned a career total of seven Grammy nominations, including this year’s nods for Best Rap Song (“We Dem Boyz”) and Best Rap Album (BLACC HOLLYWOOD). Other nominated tracks include the chart-topping “Black and Yellow,” 2012’s RIAA platinum-certified “Remember You (Feat. The Weeknd),” 2011’s “Young, Wild & Free (Feat. Bruno Mars),” Wiz’s 3x platinum-certified, top 10 smash partnership with Snoop Dogg (featured on their 2011 collaborative soundtrack, MAC & DEVIN GO TO HIGH SCHOOL), and Maroon 5’s 2012 worldwide hit, “Payphone (Feat. Wiz Khalifa).” Wiz Khalifa recently released his newest album, Blacc Hollywood, which debuted at #1 on Billboard’s Top 200 album chart. More than just a music powerhouse, Wiz is also a fashion-forward icon and entrepreneur. His Taylor Gang Ent. label and brand recently united with leading active lifestyle brand Neff for a 26-piece apparel collection. They also launched Freshko, a new lifestyle brand co-created by Sketch, a well-known graphic artist from San Francisco. Additional highlights include partnerships with luxury headwear designer Flat Fitty, RAW® rolling paper (www.rawthentic.com), and Converse. 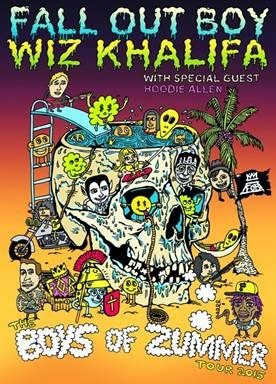 For more information please visit www.wizkhalifa.com. Fall Out Boy & Wiz Khalifa – Boys of Zummer 2015 Tour Dates.